Collecting Children's Books: The Good Master! Sweet Ladies! The Good Master! Sweet Ladies! Back on December 31, in my very first blog entry, I picked GOOD MASTERS! SWEET LADIES! 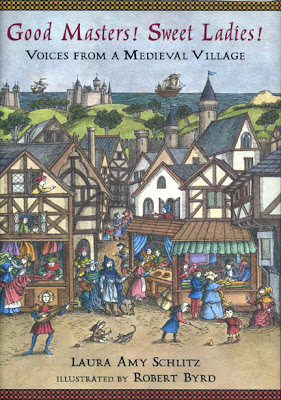 : VOICES FROM A MEDIEVAL VILLAGE by Laura Amy Schlitz as a possible Newbery Honor Book. Less than a month later, this book didn’t just win silver, it won gold. News that GOOD MASTERS! SWEET LADIES! won the Newbery got a mixed response. Some think this unique volume -- a collection of dramatic monologues related by the denizens of a thirteenth-century hamlet -- is a daring selection and exactly the type of book the award was meant to recognize. Others feel this title lacks kid-appeal and, though it may be useful in classrooms, it’s unlikely to be truly embraced by young readers. I tend to agree that this book has a tough row to hoe -- especially buried back in the Dewey Decimal section, instead of sitting on the fiction shelves with most of its brethren. Time will tell whether GM!SL! will become one of Newbery’s Greatest Hits. My guess is that it’s likely to be one of those books ultimately more admired than loved. It does, however, mark the arrival of major new voice in children's books, especially coming on the heels of the author's acclaimed Grimm retelling, BEARSKINNER, and beguiling novel A DROWNED MAIDEN’S HAIR. 3) After GM!SL! was accepted by Candlewick, it took seven years for the book to be published. SEVEN YEARS! I wonder if this book would have won the Newbery if it had been published during one of those earlier years. Could it have beaten CRISPIN : THE CROSS OF LEAD or THE TALE OF DESPEREAUX? Probably. What about KIRA-KIRA, CRISS CROSS or THE HIGHER POWER OF LUCKY? There are too many factors involved, including the annual pool of candidates and the unique composition of each year’s award committee, to ever say for sure -- but it’s still fun to ponder. Seven years seems like an extraordinarily long wait between acceptance and publication -- probably more the exception than the rule. But most writers would tell you that nowadays every book takes a year to be published at the very least...and most take eighteen months, two years, sometimes even longer than that. The irony is that it wasn’t always this way. Believe it or not, publishing actually moved faster BEFORE computers, e-mails, faxes, and other marvels of modern technology arrived on the scene. Case in point: THE GOOD MASTER by Kate Seredy, a classic Newbery Honor Book that’s the near-namesake of this year’s winner. Story has it that Seredy went to see Viking Press editor May Massee about getting an illustrating job in early 1935. As they chatted, Seredy told the editor about her Hungarian background, and Massee replied, “Go home and write a book about your childhood in Hungary.” (Gosh, editors usually stop after the first two words when dealing with me.) Massee told Seredy that if she could complete her manuscript that spring, she’d publish it before the holiday season. Seredy went home and wrote an autobiographical story about a headstrong city girl who is sent to live with her uncle’s family on a rural Hungarian horse ranch. Though English was her second language, Seredy completed the novel in two months and returned the HANDWRITTEN manucript to Massee in the spring of 1935. The book was published in October of 1935. That’s right, a handwritten manuscript submitted in the SPRING was already published and in the bookstores by OCTOBER. And one can’t even argue that the book suffered because it was “rushed” into publication. It went on to be named a Newbery Honor Book, is still in print, and continues to be enjoyed by readers today. Meanwhile, Massee was editing a full-slate of books (including another 1936 Newbery Honor, the 1937 Newbery winner ROLLER SKATES, and three of 1937’s Honor Books) and Kate Seredy kept herself busy designing a hand-crafted model of a Hungarian farm that was exhibited around the United States to help publicize THE GOOD MASTER. Seeing how quickly -- and how well -- our literary forebears worked (in a world without computers or modern technology, no less!) makes today's publishers seem like a bunch of "poky little puppies" in comparison.